I have a new love and its name is Snickers caramel apple pie. It’s true, it’s so true. 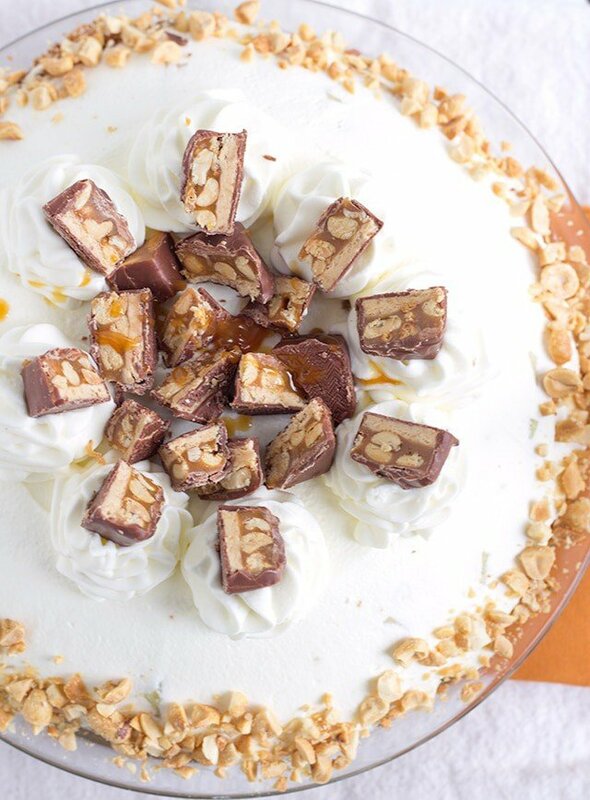 It’s *almost* no bake. I bake the graham cracker crust to set it, but other than that completely no bake. The pie looks like it took a ton of work to put together, but it wasn’t. Shh.. let’s keep that between us. I want everyone to think I slaved away for hours for them. The cream cheese and caramel are very rich. They go amazing together, but really sweet. What better way to break up the sweetness but with some fresh and tart granny smith apples diced up. I peeled, cored, and diced them and sprinkled a little cinnamon on them for flavor. It was was perfect. Make sure your apple pieces are fairly small. The bigger the pieces are, I’m sure the less pleasant biting into them will be. I’ve been feeling pretty horrible this week, but I feel like this pie made it a wee bit better. That and the heavy duty antibiotics and pain killers. Dessert blogger gets a swollen face and a possible infected tooth. Typical. It’s kind of crazy. The same week my face and my husband’s face swells up and we’re both in agony. 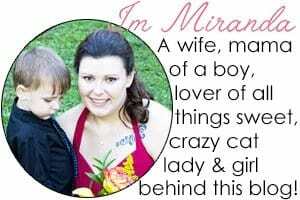 I know we’re married and all, but should we really be getting the same issues at the same time? Strange, I tell you! In a mixing bowl, add in the graham cracker crumbs, sugar and melted butter. Stir to combine. Press into an 8 inch pie plate. Place in the oven and let bake for 13 minutes. Remove from the oven and let cool. In a mixing bowl, add in the cream cheese and sugar. Mix on medium until incorporated. Spread the cream cheese into the bottom of the pie crust. Spread it evenly. Spread the caramel apple dip over the cream cheese mixture. Make sure it's evenly spread out. I used the caramel apple dip that you can find next to the apples in the grocery store. Place the diced cinnamon apples on top of the caramel apple dip. They will form a mound. In a mixing bowl, add in the cold heavy cream. Beat on medium/high until the whipped cream becomes thick and forms a soft peak. Add in the powdered sugar and continue to mix on medium/high until stiff peaks form. Set aside about 3/4 cup of the whipped cream to place in a piping bag with the 1M tip. Pile the whipped cream on top of the apples. 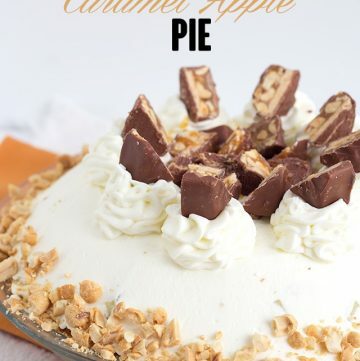 Be sure to cover the apples completely with the whipped cream and build a little higher mound. I used a cake spatula and smoothed out my whipped cream. 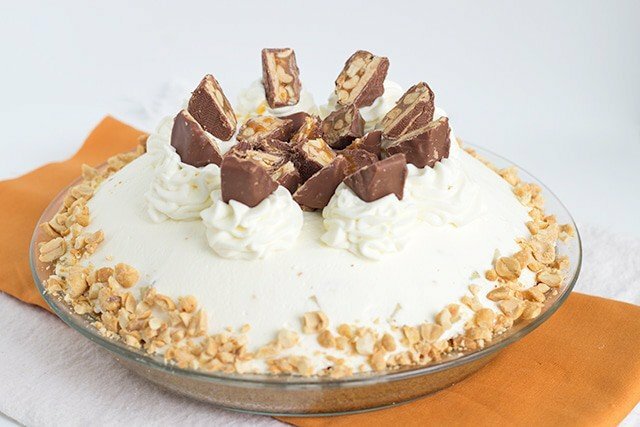 I also flattened out the very top so I could add Snickers to it. Place the 3 tablespoons of chopped peanuts on a plate. 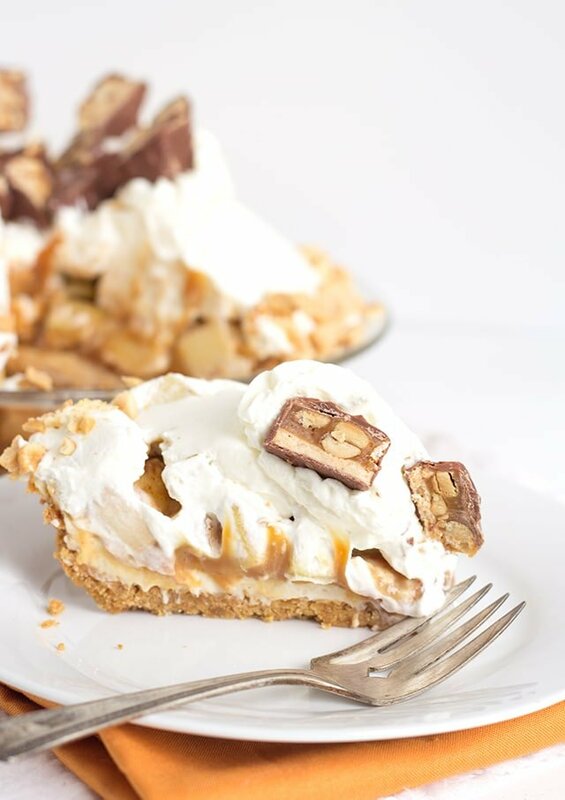 Grab a handful of the peanuts and press them into the bottom edge of the pie. Add 8 nice tall swirls of whipped cream to the top of the pie where it's flattened out. Cut all the Snickers bites in half. If they're chilled, they'll stay together a little better. Place a snicker on each of the swirls. Place the rest in the center of the pie. Wow, this pie looks too good to eat. Yum. 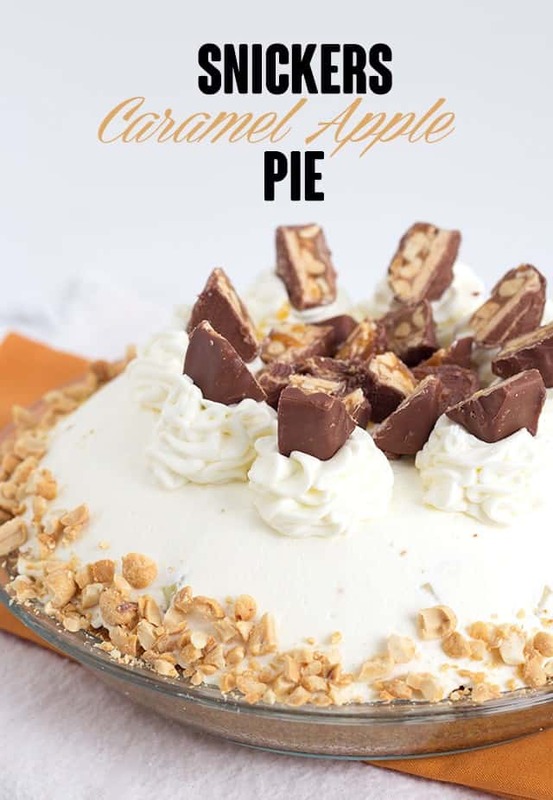 What a beautiful looking pie and the combination of apples and cream cheese and caramel sound heavenly together.